The Vodafone R226 looks absolutely identical to “Speedport Mini II “by Telekom, just carries the Vodafone logo. 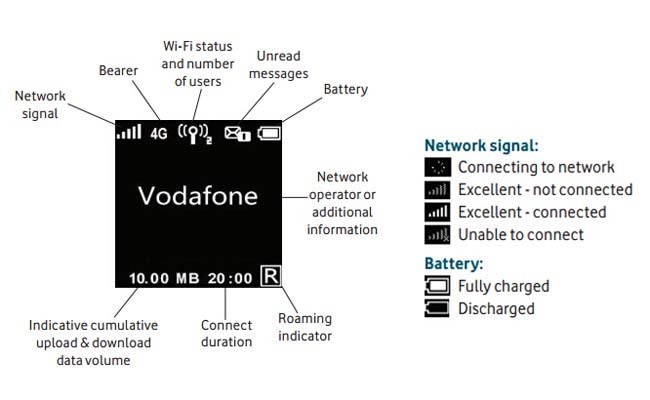 On the front of the Vodafone R226 is a large display that clearly displays a variety of information in black and white format. Thus, for example, we can see about the used data volume, online time or the battery level. The operation of the Vodafone R226 is done via the smartphone app “Vodafone Mobile Wi-Fi Monitor” or a web interface. User can enter the address 192.168.8.1 in the browser. If user want to improve reception, to connect an external antenna is possible. In addition, the Vodafone R226 provides a slot for a MicroSD memory card, so you can share files between multiple devices. The SIM card must be in micro-SIM format and is inserted under the cover on the back. From the feedback of users, Vodafone R226 improves much than previous model such as R215 and R208. With the latest technology, Vodafone R226 would be reliable partner for travel.